This Meerkat appeared to be the group’s “Lookout”. It was sitting on an upturned log, and making a sharp, brief “Chuck” repeated call - not overly loud. There was a group of gulls circling high overhead - which might suggest it was a “be aware” call - rather than a “danger” call. Nice shot. The meerkat doesn't seem to panic, but is cautious at the same time. Had you watched for some more time, probably we could have known why. Thank you Raghu for your very observant comments! I was having a “bad day” trying to resize the photo - and couldn’t get the size right - too large or too small! So to help lower my blood pressure (!) I posted the small one! However, I had written a brief explanation which I accidentally omitted. Here it is, as originally written! 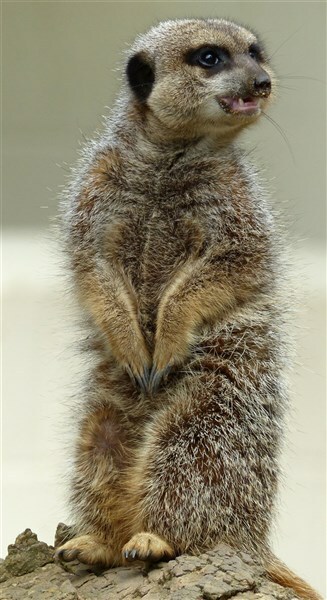 "This Meerkat appeared to be the group’s “Lookout”. It was sitting on an upturned log, and making a sharp, brief “Chuck” repeated call - not overly loud. There was a group of gulls circling high overhead - which might suggest it was a “be aware” type call - rather than a “danger” call."